Do Female Deer Have Antlers: Reasons why Not All Female Deer Have Antlers though all male Deer Have Antlers Except Those Who Are Castrated at Their Tender Age? A doe is a female deer. Antlers are branched paired structured extensions to the anterior bone of the skull in mammals from deer family (Cervidae). The defensive structures are made of phosphorous and calcium. 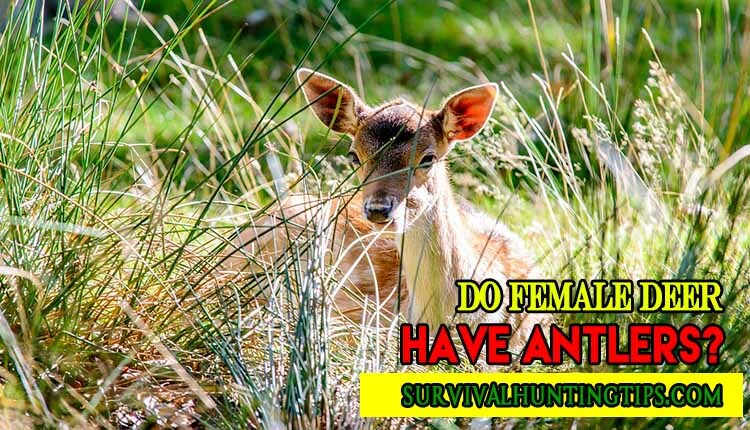 What Is The Main Habitation Of Female Deer? How Do Antlers Develop In Female Deer? Why Do Caribou Deer Species Have Antlers? What Does Antlers Confer To Female Deer? Does It Mean That All Bucks Have Antlers? What Makes Some Bucks Lack Antlers Like A Majority Of Female Deer? What Causes Hormonal Imbalances In Female Deer? Are The Female Antlers Similar To Bucks In Structure? What Is An Antler Cycle? In Which Season Do Antlers Start To Grow? When Do Female Deer Shed Off Their Antlers. What Are The Uses Of Antlers? What Happens To Deer That Have No Antlers? What Are The Other Preferable Adaptive Features For Female Deer? Generally,all families including the female deer with antlers live in rainforests, mountains, grasslands, and deciduous forests. Do Female Deer Have Antlers? Not all, antlers are among the most important adaptive features that help deer in surviving in these varying ecological environments. Daylight loving hormones such as the testosterone hormone regulate the growth of the antlers. It actually facilitates the growth of the antlers from the pedicle which has it base at the skull. Antlers advance in being branchy until they are fully developed. A velvet substance covers developing antlers and has large capillary and nerve networks for proper nourishing. Young antlers have high water content compared to its dry matter. Do Female Deer Have Antlers? Mostly only male deer have antlers. However, Caribou deer species are the only deer in which females have antlers of all the known deer species such as elk, red deer, roe, fallow moose etc. Do Female Deer Have Antlers? Yes, Caribou also referred to as the reindeer lives in snow regions mostly in Alaska, North America. Reindeer’s antlers extend to the nose. This is an ecological adaptive feature that helps them in shoveling snow in search for pastures. An exemption of some other doe species could also have antlers due to higher than optimal testosterone hormone levels in their bodies. This involves exceptional cases like for caribou species and to the female deer where testosterone hormones levels are above optimal. The antlered females tend to be more aggressive even in protecting fawns than those that have no antlers. Hormones are the main determinants for antlers growth and so any nonstandard antler characteristic based on hormonal imbalances. When some buck lack antlers, the testosterone hormone is below optimum. It is normal for a male deer to have antlers while is abnormal for a female deer. Innate testosterone traits are inheritable. Most of the food consumed by the deer is important in supporting the growth of antlers which require a lot of energy. For effective formation of antlers, the food should have high phosphorous and calcium levels as well. Mature deer have a bigger age factor and they regenerate stronger antlers compared to the young ones due to the high testosterone hormone levels in their bodies. For the caribou, it is hard to differentiate the females and male antlers since they are almost of similar size and shape. Those that have developed antlers due to hormonal abnormalities have weaker and smaller antlers. This is due to the unpredictable testosterone levels in their bodies, which is sometimes above optimal and lower than normal at other times. Once the antlers are fully developed, they shed off after approximately a year and other are formed due to a fall in testosterone levels cause wearying off of the pedicle hence the shedding off of the antler. Shedding off of antlers precedes decrease of melatonin hormone. This stimulates the production of the daylight loving hormones such as testosterone which makes them to gradually grow. Later shedding off comes after a year and the cycle continues. Regeneration of antlers begins during summer time when daylight periods are slightly higher than all other seasons. Testosterone hormone levels pick at this season of the year. Shedding off the antlers takes at winter period. The testosterone levels in this time of year defer a lot. At this period the level of testosterone is relatively low than in any other given season. Antlers are useful for protection against predators and inter-male fights for territorial dominance. After locking of antlers and fights, stronger males dominate the grazing zones and usually have a larger number of mates. It happens for both male and female deer having no or with weak antlers are subjects of the strong antler deer. However, they have a wide range of adaptive characteristics that help them survive in grasslands and rainforests. Female deer have other ecological adaptations that give them the ability to maneuver and increase their survival rate in the forest that is full of predators. Female deer alter fawn’s localities, are swift-they have strong, long muscled limbs and have large eyes that give them a wider view for noticing predators, their hooves are also weapons against predators. Camouflaging this is where female deer blend with their environment in an attempt to keep themselves away from predators and hunters. Nature is ever too spectacular and amazing to fathom as far as deer are concerned. Their antlers are yet another phenomenon so unique that is rarely experienced in any other animal type. Do Female Deer Have Antlers? It is evident that the majority of female deer have no antlers. This is due to the low testosterone levels in their body, only the caribou type that has both male and female deer with antlers. However, this is a special adaptation to their ecological settings. The whole concept of development, regeneration, and evolution of antlers opens a varied number of topics of interest for research. These studies would generate and increase the scope of knowledge in ecological conservation for deer as well as all other animal kingdoms.